Education has always been behind progressive art. But at this point in time, it appears that art is actually changing education. I believe that ideally, a good teacher knows how to engage the right and left sides of their brain to present an idea accurately and entertainingly. After all, what else is a teacher than a purposed educator? The creative side and the book-smart side of one’s self must collaborate to properly inform students, so that they may care about what they’re learning as well as retain it. That said, I’ve noticed more and more artists becoming teachers. Being involved with independent music myself, I can name a few off the top of my head: Alfred Brown IV from Dangers (Writing Professor at University of Southern California), Aaron Weiss from mewithoutYou (Education Professor at Temple University in Philadelphia), Greg Graffin from Bad Religion (Life Science Professor at UCLA), and Mike Armine from Rosetta (high school teacher of Psychology, Sociology, and American Government). That’s not where it stops though - painters, poets, actors, and filmmakers often enter education as a stable way to make money and teach people their crafts. Because of this, the arts are changing education as we know it for the better. Art has always been changing the way people digest learning, intentionally or otherwise. Take, for instance, the ceiling of the Sistine Chapel. 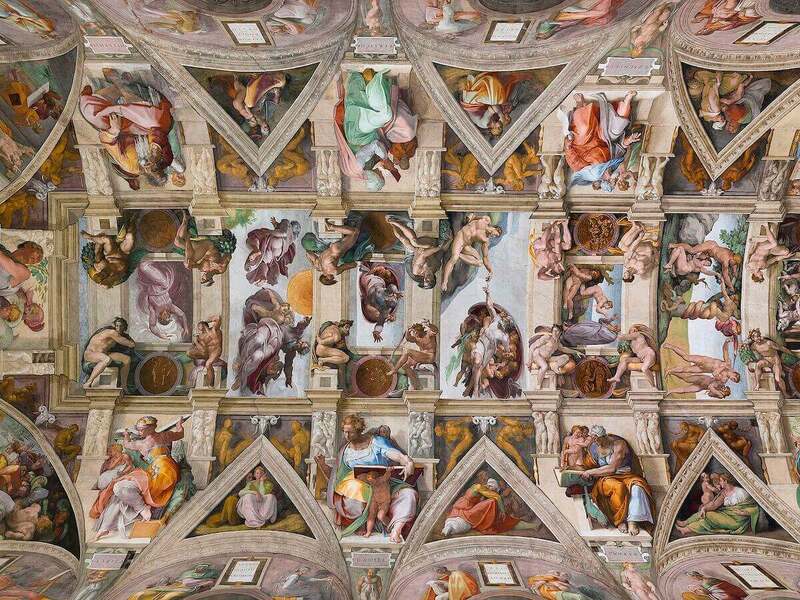 You cannot tell me that Roman Catholics in the 1500’s didn’t have their idea of God and Christianity changed due to such a giant art piece sitting above them every time they entered. Move that forward several hundred years to the emergence of hip hop, where the political and social struggles of the black community were being shared with the white western world due to groups like N.W.A., Public Enemy, and Wu-Tang Clan. People could learn a lot about police brutality just by listening through the second song on Straight Outta Compton. Even cave paintings and centuries-old fiction novels inform us about the past. Take any history class, and art is all over the curriculum. But while art and education have never been separate, we rarely talk about the infiltration of education by art. We never talk about how the system has changed, and rather than education influencing art, art influencing education in turn. A lot of it comes down to educational format. The introduction of movies and film into classrooms is a prime example of art changing the field of education. Entertainment art specifically is specifically used in classrooms as a means of educating students through familiarity and visuals. Even Bill Nye the Science Guy was shown to me in class up through tenth grade! Famous art pieces are in most history books, as they often illustrate historically important people and events, so in that way visual learning is increasingly pushed alongside text and lectures. Heck, even school spirit is taught to students through the use of art (banners, mascots, flags, cheerleaders, etc.). Many college professors have built their craft and reputation similarly to that of an entertainer. Pacing in classrooms, yelling emotionally about history or parts of their argument, the use of eye grabbing slideshows - these are all entertainer’s tools. The most memorable professors are the entertaining ones. They tell good jokes, they make ruckus, they do or say things that you remember that may not be directly related to what you’re studying, but they are in place to keep your attention so you will remember it later. The life of an artist is a poor one. The idea of a corporate or office job, for a lot of artists, is a metaphorical suicide. It’s frightening and philosophically contradictory to the reasons they are artists. Even if you take your art hobby and make it into a consumer-serving job in some sense (i.e. bookstores, record stores), your economic struggles will still be hard, despite businesses like yours being incredibly important to local economies. But at some point, if one is not making enough to pay their bills, a sustainable career or day job becomes necessary. I believe many of them choose to be teachers because they think that educating young minds is noble, and I think they’re right. If one can’t change the world through their art, they might as well try to influence the young minds that are inheriting the world. Education isn’t all anti-establishment or revolutionary, but it is the intellectual backbone of such things. Since artists are often performers and entertainers, the ability to engage an audience such as a classroom is already embedded as a skill set. Former actress Angela Gironan, also an assistant clinical professor in Arizona State University’s Master of Liberal Studies Program, explained the role of an artist as educator best from her personal experience: “I love being able to see… how [students are] able to widen their perspective. Getting them to think critically and less binary is very exciting. It’s not entirely changing perspectives, but adding to the layering of perspectives.” Artists have the power and ability to wield a platform, which is absolutely necessary for good teaching. The exchange between art and education will always be growing and changing, and it’s interesting to see how the mind of an artist may work as an educator. I’m at a point in my life where I am becoming conscious of this artist to teacher phenomenon and will be excited to see how it plays out in my lifetime. Have you noticed this yourself? Let me know on Twitter @Robolitious.